Once you have 3D elements, you can add them to your 2D scene in Storyboard Pro by dragging them into a panel, positioning and adjusting them so they fit in the scene, and animating them so that they interact smoothly with the 2D elements. When you export a 3D element in FBX format, the export includes any textures you applied to it, so those textures will appear in the Shaded view. When you import the 3D element in Storyboard Pro and drag it into your scene. Also, if your 3D elements have pivot points, you can manipulate the objects using pivot points—see Modifying the Individual Nodes in the 3D Object. 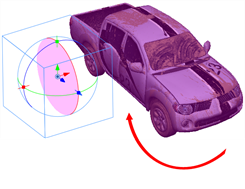 Once you have imported 3D objects into your scene, you may want to change the size, position, and angle of the 3D object—see Modifying Imported 3D Objects. Once you have a 3D object in your library, you can insert into a panel just like any other element: you drag it from the Library view to a panel and position it in the scene. In the Library view, open the 3D Models folder and then open the format folder that contains your 3D object. Drag the 3D object into your panel, the Stage view, or Camera view window. The object appears at its default size in the middle of the panel. To place or modify the 3D object, use the First Frame Transformation or the Last Frame Transformation buttons. • Move, rotate, or transform your object—see Modifying Imported 3D Objects. 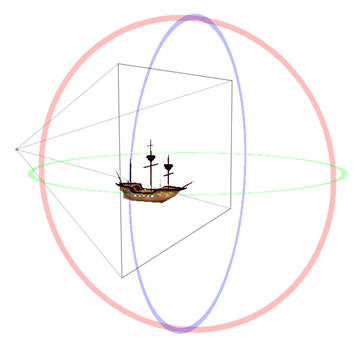 • Animate the 3D Object—see Animating 3D Objects. • Display the various layers of the 3D object—see 3D Object Layer Display. When you import a 3D object into a panel, you can place it in the 3D space much just as you would a 2D element by clicking directly on it and dragging it into place along the X, Y, and Z planes in the 3D space—see Positioning Elements in 3D Space. • Rotating the object on a pivot point. • Changing the dimensions of the 3D object. • Modifying the individual nodes in the 3D object. Once you place your 3D object in your panel, you can create some basic animation with it using the First and Last Frame feature. Being able to animate your 3D object allows you to create interaction between 2D and 3D elements. 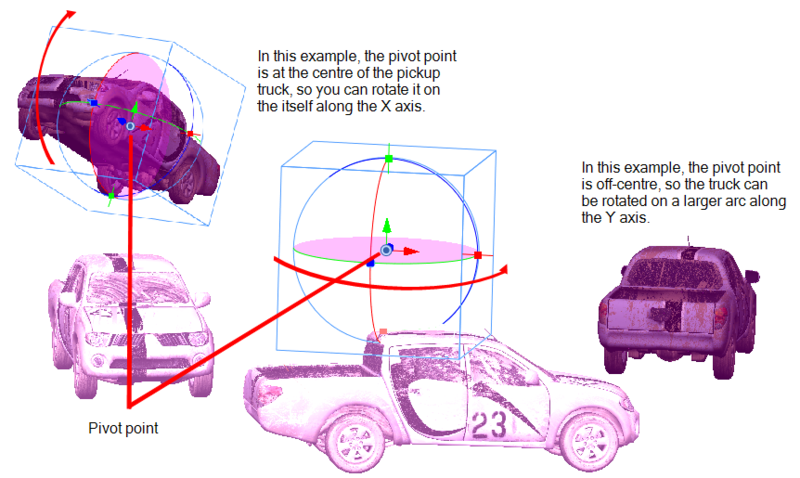 The pivot point defines the size of the arc upon which you will apply the rotation to the 3D object. When the pivot point is in the centre of the object, the object rotates upon itself. But when you place the pivot point on the outside of the object, the object will rotate a larger axis with the pivot point at the centre. In the above examples, the pivot point was moved to the side of the object for illustrative purposes. By default, the pivot is positioned below the 3D object at its centre. 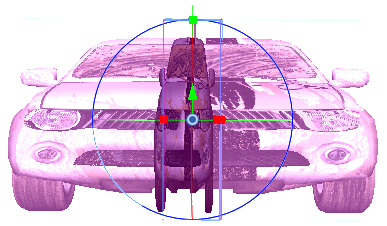 Depending on the pivot point’s position, the object’s rotation arc will change. Click the First Frame Transformation button and select an element from your scene in the Stage view. 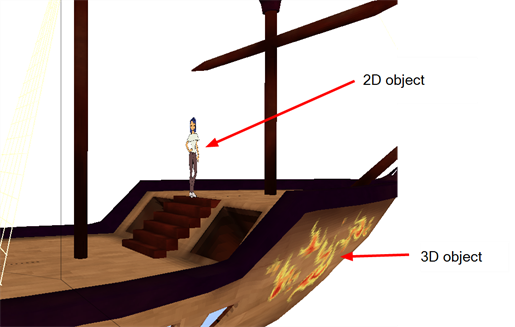 Use the views to see how the object looks from the Camera, Top, and Side views. Just as you can transform the object as a whole, you can also apply transformations to the individual nodes of the 3D object. 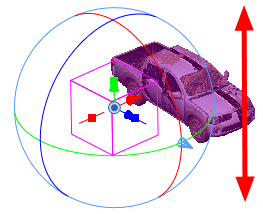 To select a node in the 3D object, select Window > 3D Nodes. ‣ Zoom In/Out: Increases (zoom in) or decreases (zoom out) the magnification. You can also press  to Zoom Out or press  to Zoom In. ‣ Reset Zoom: Restores the magnification to its default setting. ‣ Reset Pan: Resets the 3D node tree to its default position. ‣ Reset view: Restores the 3D node tree to its default position and magnification. You can reposition the 3D node tree in the window by pressing the [Space bar] and dragging the cursor inside the 3D Node window. You can also select the nodes using [Ctrl]+click (Windows) or [⌘]+click (Mac OS X). To select all the nodes, right-click the 3D Nodes window and select Select All. By default, the basic node structure appears in the 3D Nodes window. NOTE: To show or hide a detailed hierarchy that makes up the 3D element, right-click inside the 3D Node's window and select or deselect Extended Display Mode. 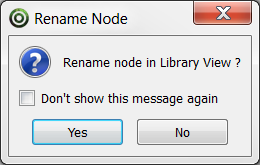 Select the node you wish to restore by [Ctrl]+clicking the node in a view window or by selecting it from the hierarchical position in the 3D Nodes window. If you use the 3D Nodes window, you can select multiple nodes by [Ctrl]+clicking each one. Select Layer > Reset Selected 3D Nodes. The selected nodes return to their default settings. You can use the 3D Nodes UI tab in the Preferences to change how the hierarchy is displayed in the 3D Nodes window. Select Edit > Preferences and select the 3D Nodes UI tab. In the Colours section, select the colour to display for each item in the 3D Nodes window. These colour selections only apply to the features in the 3D Nodes window; they do not apply to the 3D element in your scene. In the Label Text section, determine how the text is displayed in the 3D Nodes window from the Font menu. • You can use the Undo command to undo any of the changes you made to the object or in the panel since the project was last saved. • You can use the Reset Transform command to revert to the object’s original settings (position and dimensions). Now that you understand all the different changes you can make to a 3D object in your panel, you can create an animation with it using the first and last frame of the panel. You can modify the object in the first frame of the panel, modify the object in the last frame of the panel, and Storyboard Pro will transform the object from its first state to the last state at a speed defined by the duration of the panel. 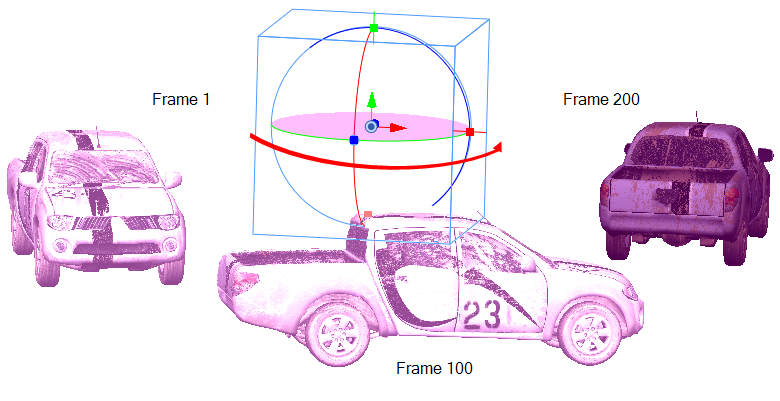 In the above example, the pickup truck starts on the left at frame 1 and ends on the right at frame 200. 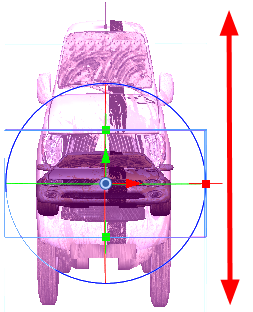 Storyboard Pro interpolates the various positions and rotations of the pickup truck as it moves from its initial state to its final state. For suggestions of how you can use this interpolation to animate your 3D objects, see Animating Interaction between 2D Objects and 3D Objects . Click the First Frame Transformation button, select an element in the scene, and place it in its initial state. You can also make a multiple selection to move multiple 3D layers at once. Click the Last Frame Transformation button, select the same element, and place it in its final state. Click the Play button to see the animation of the element as it moves from the first frame position to the final frame position. The speed of the animation depends on the length of the panel, which is displayed in the Timeline view—see Changing the Panel Duration.